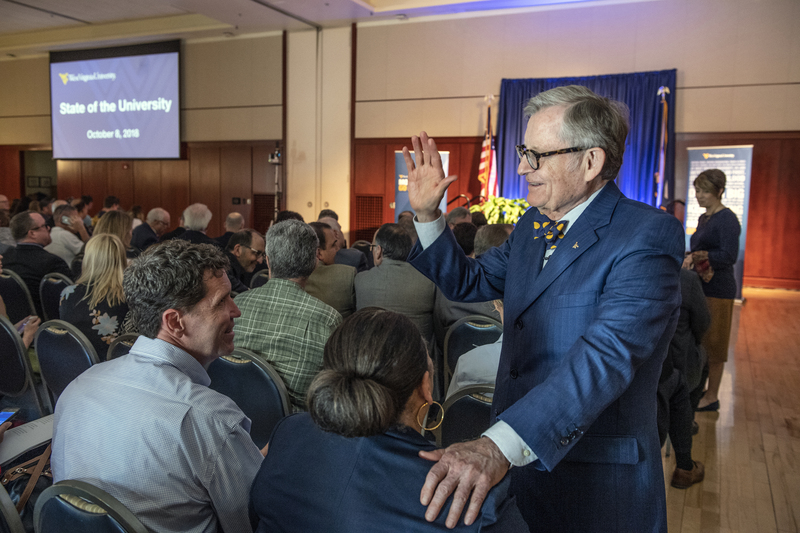 President Gordon Gee delivered his State of the University address today (Oct. 8). But before West Virginia and its flagship University can be successful, there are challenges that must be overcome, including, Gee said, the fear of failure. “(W)e need to take strategic risks if we are to move this University forward,” Gee said. “And with every risk, there is the chance it will not work out the way we planned. With each misstep we find a new direction that may lead to the answer we are seeking. Without mistakes, we cannot learn, and we cannot and will not grow. Focused on WV Forward findings, WVU is helping to build an innovation ecosystem critical to the state’s future, Gee said. A blueprint to advance the state's economic future, WV Forward began as an unprecedented collaboration among West Virginia University, the West Virginia Department of Commerce and Marshall University. By 2019, a comprehensive toolkit will outline the entrepreneurship assistance available across the state, a one-stop shop for investment, grant, debt and equity sources, Gee said. The toolkit will help empower new investments, start-ups and commercialized technologies while meeting the needs of current stakeholders. Additionally, WVU will address a WV Forward blueprint “burning platform opportunity” by offering a new online master’s degree in business cybersecurity, an FBI “most wanted talent” in the 21st century. WVU Tech will offer a program in adventure recreation management to help students master the administration of an outdoor recreation business, Gee said. WVU’s close relationship with the Boy Scouts of America is an essential component of a new major, organizational leadership, which will help prepare students for careers as executives in youth development organizations such as Scouts, 4-H and other non-profits. “By developing programs that meet the needs of the market, we are establishing pathways that can lead to a job in West Virginia, improving both the University’s outcomes, as well as our state’s economy,” Gee said. WVU’s efforts to strike a blow at the opioid crisis are not confined to the health care sector, Gee said. WVU is taking aim with a new approach to the opioid crisis by offering a minor in addiction studies. The minor is open to all undergraduates and will emphasize both prevention and clinical interventions for opioid and other substance abuse disorders. Gee said the well-known state statistic of leading the nation in opioid overdose deaths is foreshadowed by a lesser-known figure—West Virginia has fewer than half the national average number of addiction counselors per capita. The School of Social Work has earned federal funding for 10 students who are committed to practicing in West Virginia and the region. WVU is also focusing on other health issues in the state, including heart disease, the leading cause of death in West Virginia. WVU Medicine recently announced plans to start the state’s first heart transplant program at the WVU Heart and Vascular Institute, a “huge advance toward a healthier West Virginia,” Gee said. Research into Alzheimer’s disease continues at WVU, as well. The WVU Rockefeller Neuroscience Institute, led by Dr. Ali Rezai, has been selected as the first site for an innovative clinical trial to treat patients using focused ultrasound. While Gee focused on the many accomplishments at the University over the past year, he did not shy away from talking about the controversy that has surrounded Fraternity and Sorority Life on WVU’s Morgantown campus. Gee said WVU chose to try collaboration with fraternities after receiving reports of drug and alcohol abuse, physical altercations, disorderly conduct, sexual misconduct and hazing; however, final recommendations that included raising academic standards, increased oversight and a membership deferral period for freshmen were met with objection by five fraternities that have dissociated with WVU. Those fraternities will not be recognized by WVU for 10 years. Gee also addressed the ongoing issue surrounding the role of higher education in the state, noting that WVU must press for accountability in the higher-ed system. As co-chair of the Governor’s Blue Ribbon Commission on Four-Year Higher Education, Gee is working to change the funding model for four-year universities. In light of recent state budget surpluses, Gee recommended returning state money to WVU and all of West Virginia’s colleges and universities to replace several years of budget cuts. President Gordon Gee greets faculty members prior to his State of the University address.